The Fourth Annual Falmouth Flag Day 5K Run/Walk to benefit the Falmouth Education Foundation raised more than $9,000 for education on Sunday, June 8. 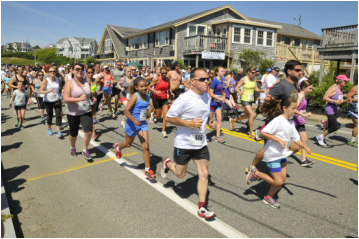 The 3.1-mile course through Falmouth Heights regular attracts hundreds of runners. Sprint races for ages 9-and-under were staged on the Heights ballfield. Children aged 7, 8 and 9 ran one lap, a quarter mile, around the field. Ages 4, 5 and 6 ran 50 yards, and a “diaper dash” of 20 yards was held for ages 3-and-under. The sprints were supervised by Teaticket School physical education teacher Carrie Shanahan and a team of other volunteers. The principal race sponsors were The Cooperative Bank of Cape Cod, Cape Cod Sports Medicine, Harvard Pilgrim Health Care and Liam Maguire’s Irish Pub. Contributing sponsors are Uptown Body, WEEI Sports Radio, Soft as a Grape and New Balance, Mashpee. The race is directed by former Falmouth Road Race co-directors Kathy and Rich Sherman, and former Falmouth Road Race staff member Jo-Ann Leaf. The race e-mail is FlagDay5K@gmail.com.